The Aircraft Nuclear Propulsion (ANP) program and the preceding Nuclear Energy for the Propulsion of Aircraft (NEPA) project worked to develop a nuclear propulsion system for aircraft. The United States Army Air Forces initiated Project NEPA on May 28, 1946. After funding of $10 million in 1947, NEPA operated until May 1951, when the project was transferred to the joint Atomic Energy Commission (AEC)/USAF ANP. 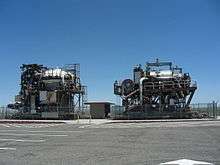 The USAF pursued two different systems for nuclear-powered jet engines, the Direct Air Cycle concept, which was developed by General Electric, and Indirect Air Cycle, which was assigned to Pratt & Whitney. The program was intended to develop and test the Convair X-6, but was cancelled in 1961 before that aircraft was built. Direct cycle nuclear engines would resemble a conventional jet engine, except that there would be no combustion chambers. The air gained from the compressor section would be sent to a plenum that directs the air into the nuclear reactor core. An exchange takes place where the reactor is cooled, but it then heats up the same air and sends it to another plenum. The second plenum directs the air into a turbine, which sends it out the exhaust. The end result is that instead of using jet fuel, an aircraft could rely on nuclear reactions for power. In 1955, this program produced the successful X-39 engine, two modified General Electric J47s, with heat supplied by the Heat Transfer Reactor Experiment-1 (HTRE-1). The first full power test of the HTRE-1 system on nuclear power only took place in January 1956. A total of 5004 megawatt-hours of operation was completed during the test program. The HTRE-1 was replaced by the HTRE-2 and eventually the HTRE-3 unit powering the two J47s. The HTRE-3 used "a flight-type shield system" and would probably have gone on to power the X-6 had that program been pursued. On February 5, 1957, another reactor was made critical at the Critical Experiments Facility of the Oak Ridge National Laboratory (ORNL) as part of the circulating-fuel reactor program of the Pratt and Whitney Aircraft Company (PWAC). 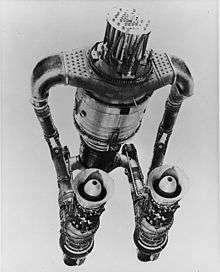 This was called the PWAR-1, the Pratt and Whitney Aircraft Reactor-1. The purpose of the experiment was to experimentally verify the theoretically predicted nuclear properties of a PWAC reactor. The experiment was only run shortly; by the end of February 1957 all data had been taken and disassembly had begun. The experiment was run at essentially zero nuclear power. The operating temperature was held constant at approximately 1250 °F (677 °C), which corresponds closely to the design operating temperature of the PWAR-l moderator; this temperature was maintained by external heaters. Like the 2.5 MWt ARE, the PWAR-1 used NaF-ZrF4-UF4 as the primary fuel and coolant. Indirect cycling involves thermal exchange outside of the core. The compressor air would be sent to a heat exchanger. The nuclear reactor core would heat up pressurized water or liquid metal and send it to the heat exchanger as well. That hot liquid would be cooled by the air; the air would be heated by the liquid and sent to the turbine. The turbine would send the air out the exhaust, providing thrust. The Indirect Air Cycle program was assigned to Pratt & Whitney, at a facility near Middletown, Connecticut. This concept would have produced far less radioactive pollution. One or two loops of liquid metal would carry the heat from the reactor to the engine. This program involved a great deal of research and development of many light-weight systems suitable for use in aircraft, such as heat exchangers, liquid-metal turbopumps and radiators. The Indirect Cycle program never came anywhere near producing flight-ready hardware. On September 5, 1951, the USAF awarded Convair a contract to fly a nuclear reactor on board a modified Convair B-36 Peacemaker under the MX-1589 project of the ANP program. The NB-36H Nuclear Test Aircraft (NTA) was to study shielding requirements for an airborne reactor, to determine whether a nuclear aircraft was feasible. This was the only known airborne reactor experiment by the U.S. with an operational nuclear reactor on board. The NTA flew a total of 47 times testing the reactor over West Texas and Southern New Mexico. The reactor, named the Aircraft Shield Test Reactor (ASTR), was operational but did not power the plane, rather the primary purpose of the flight program was shield testing. Based on the results of the NTA, the X-6 and the entire nuclear aircraft program was abandoned in 1961. After numerous problems the project was shut down in March 1953 only to be re-opened a year later. Technological competition with the Soviet Union (as represented by the launch of Sputnik 1), and continued strong support from the Air Force allowed the program to continue, despite divided leadership between the DOD and the AEC. The election of John F. Kennedy as President changed the course. Kennedy wrote "15 years and about $1 billion have been devoted to the attempted development of a nuclear-powered aircraft; but the possibility of achieving a militarily useful aircraft in the foreseeable future is still very remote" in his statement officially ending the ANP on March 26, 1961. ↑ Colon, Raul. "Flying on Nuclear, The American Effort to Built [sic] a Nuclear Powered Bomber". Archived from the original on 2 November 2008. Retrieved 2008-11-05. "Nuclear HTRE propulsion", Above top secret . Martin, Richard, "ANP", SuperFuel, pp. 109–12 .